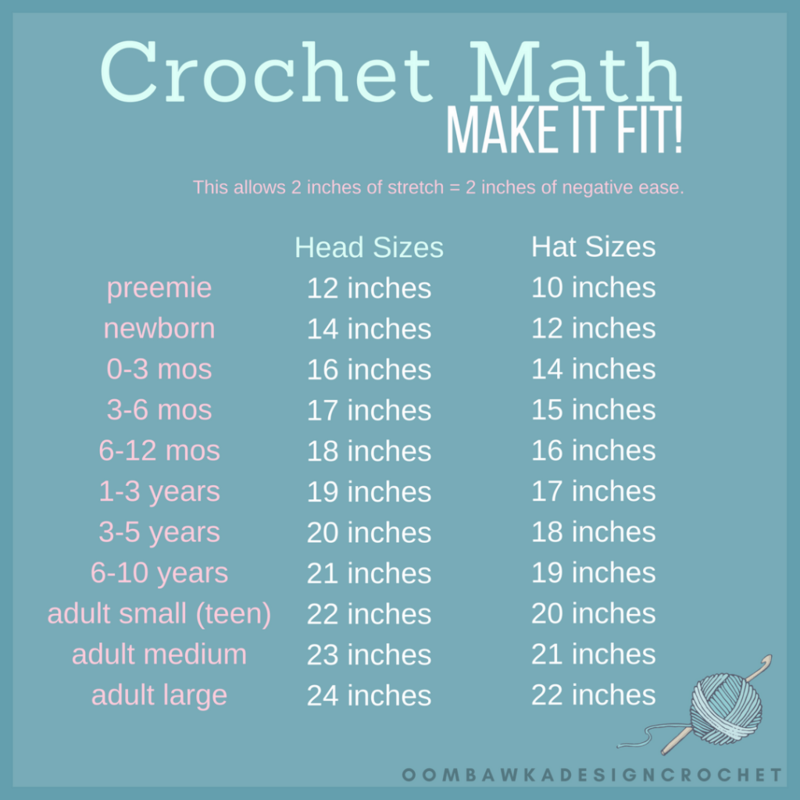 This post includes measurements for the average head sizes and crochet hat sizes for preemies to adults, instructions on how to measure your head size properly, 3 different measurements for hat heights different hat styles for babies to adults, the flat circle diameter measurements for each of the hat sizes included, instructions on how to increase for each round of your hat pattern and the starting number of stitches you need for 4 types of crochet stitches. 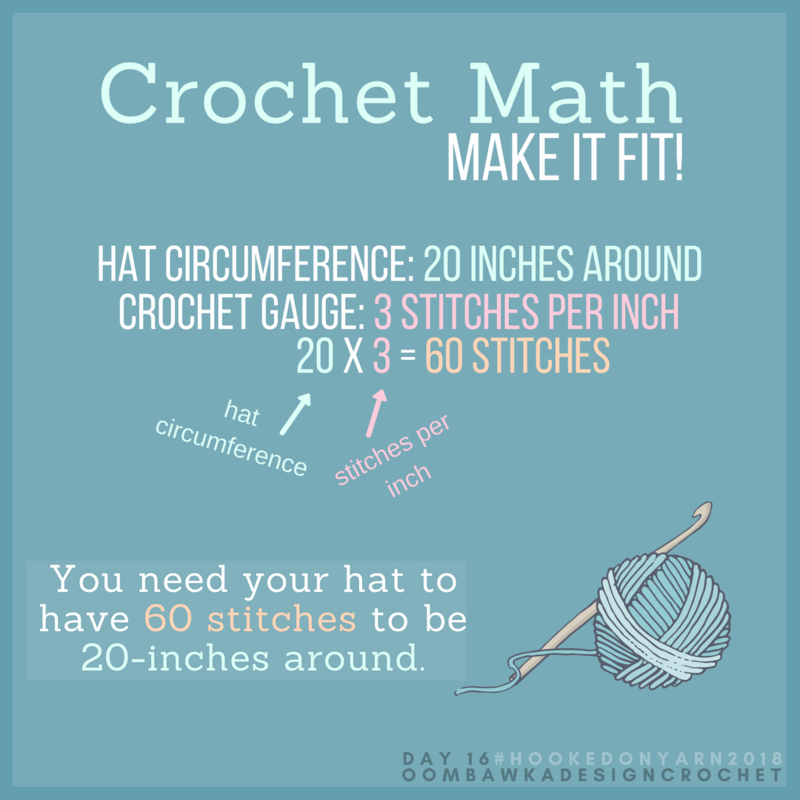 I have also included information about how to determine how many stitches you need for your hat circumference based on stitch pattern gauge. For these average head and hat sizes I have allowed 2 inches of negative ease. We allow negative ease to take into consideration how much a hat is going to stretch from being worn. Some yarns don’t stretch very much, like cotton yarns, so if you are using a fiber that doesn’t stretch you will want to allow less negative ease. I recommend increasing the hat size by 1-inch for each size listed below, if you use cotton yarns. It is also important to note, if you have a head to measure, measure it! If you do not have a measuring tape, cut a length of string approximately 30 inches long. Take your string (or measuring tape) and place the one end approximately 1/8″ above the top of your ear. Wrap the string firmly (but not tightly) around your head, across the middle of your forehead and back to your starting point at your ear. Pinch the end of the string where it meets the beginning point (don’t let go!) and remove the string from your head. Place the string on a flat surface and either continue to hold the spot where you are pinching, or use a pen to mark that spot so you can let it go. Then take your ruler and measure the length of the string. This will give you the circumference of your head. When you are making a hat you will want the hat to be slightly smaller than your head in order for it to fit properly. Depending on the type of material you are working with, the amount smaller will vary because some materials do not stretch very well. For example, cotton doesn’t stretch very well and once it has stretched it rarely goes back to its original size. You will need to make a hat closer to your head size (approximately 1 inch smaller) if you are working with cotton yarns. I have included the measurements I use below when I am working with Medium Weight  and DK Weight  acrylic yarns. I hope you find these measurements helpful. 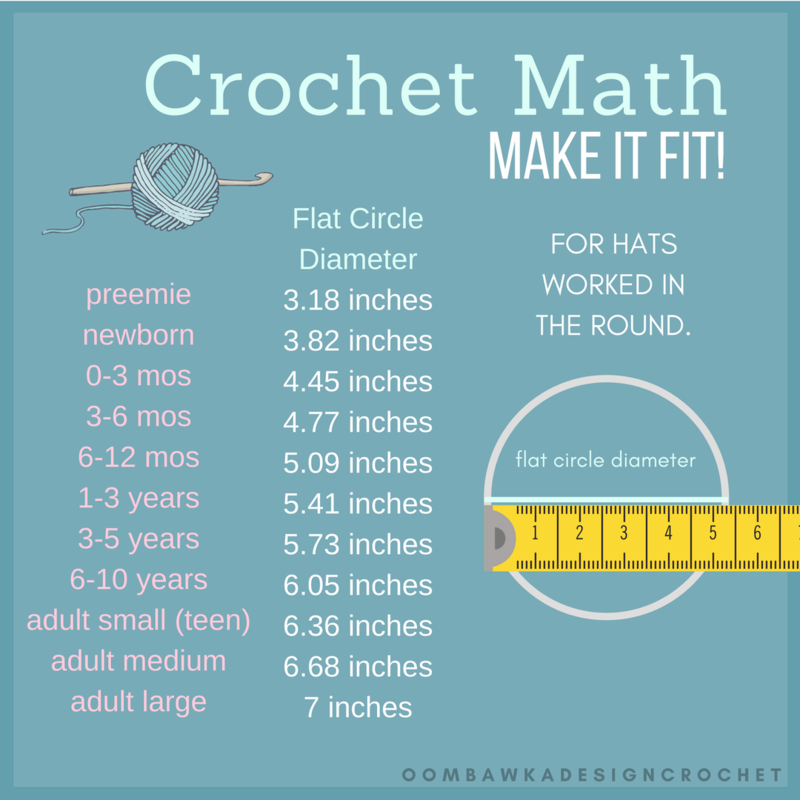 For those of you who want to make your hats in the round, you will also be needing your flat circle diameter measurement. The flat circle diameter is calculated by taking the hat circumference and dividing it by 3.14 (pi). This gives you the diameter your circle needs to reach in order for the finished hat to be equal to the hat circumference you have chosen. Depending on the height of the stitch you use, it will take more stitches to make it around for the first round of your hat and for the fabric to lay flat. This also means that when you are increasing to reach the circumference of the hat you have chosen, you will be increasing by that same number of stitches on each round. 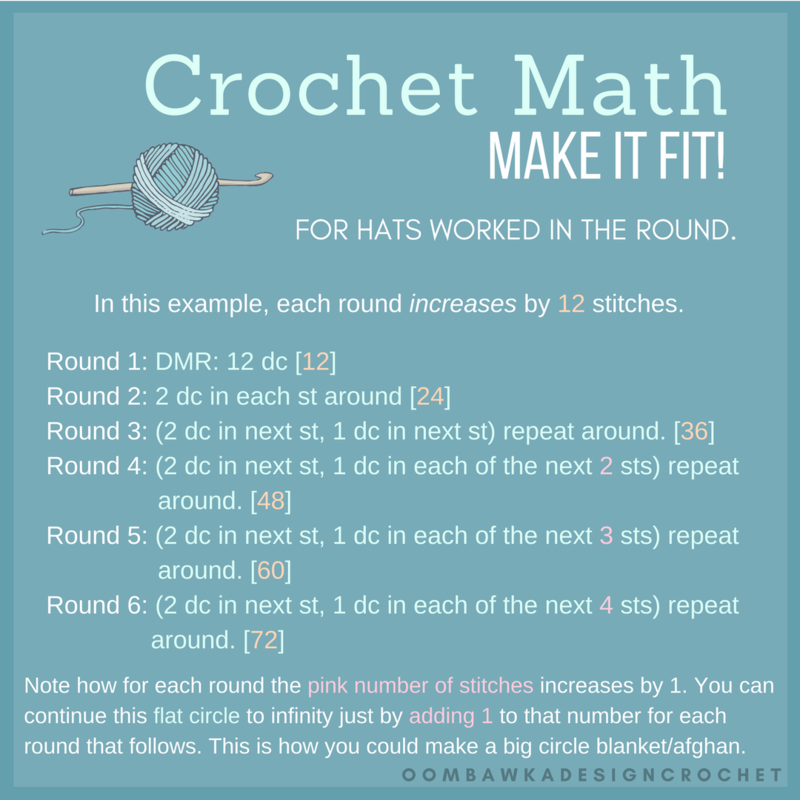 You will work these increases until you reach the flat circle diameter measurement indicated for your hat circumference and then you begin crocheting without increases until you reach the hat height you want. 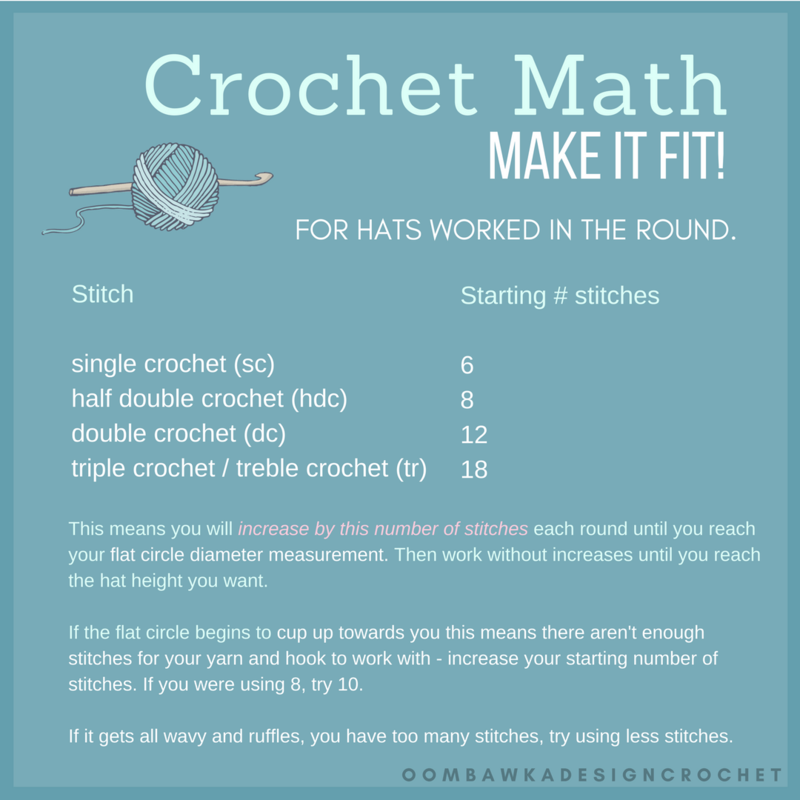 During your increase rounds, when you are crocheting your hat, if the flat circle begins to cup up towards you this means there aren’t enough stitches for your yarn and hook to work with. You will need to increase your starting number of stitches. If you were using 8, try using 10. If the flat circle becomes all wavy and it ruffles away from you, you have too many stitches for the yarn and hook you are using. Try using less stitches. After you have reached the flat circle diameter measurement and you are working the same number of stitches for each round (working even) your hat will begin to cup up toward you. This is supposed to happen and is how the hat shapes itself. If you see your hat start to get wavy and ruffled then you may have increases in the rounds you were not supposed to be increasing in. Double check your stitch count. 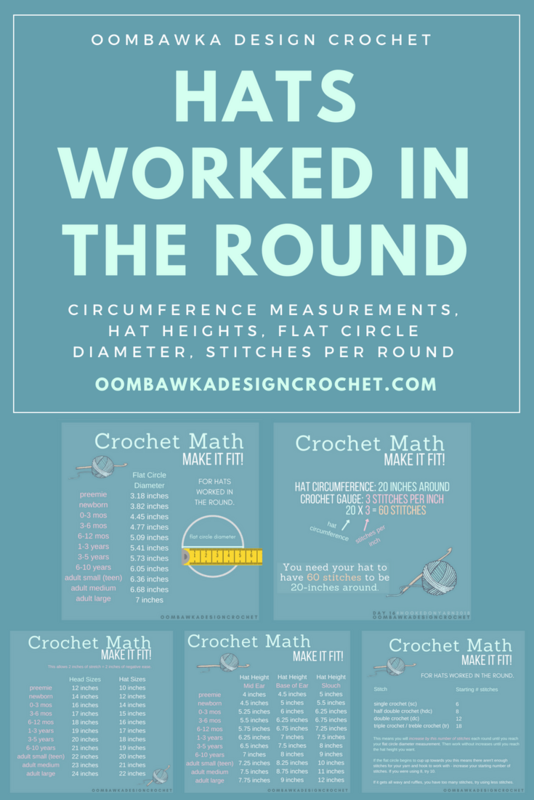 The above example explains how to increase your stitches on each round until you reach your flat circle diameter. If you wanted to continue working in a circle you could simply change the number in pink on each additional round. So after Round 6 you would work the following for Round 7. For the above example you can see that we began with 12 stitches and each round increases by 12 stitches. While we are adding these additional stitches on each round it is called ‘increasing’ so these are our Increase rounds. Once you reach your flat circle diameter, you stop increasing and you continue to work the same number of stitches in every round until you reach the desired hat height. These rounds we are working ‘even’, or without increases. Once you get used to working in the round and making increases, you can stagger your increases around the round instead of working them in the same spot each time. By staggering those increase stitches you will have a smoother hat and it will seem rounder and the increases will not be as noticeable. This technique is often used in amigurumi and you will even see instructions written for a round that say increase 9 stitches on this round. The reason they don’t say ‘where’ to work them is because they want you to stagger them around the round. It will make the finished project rounder and those increases less noticeable. 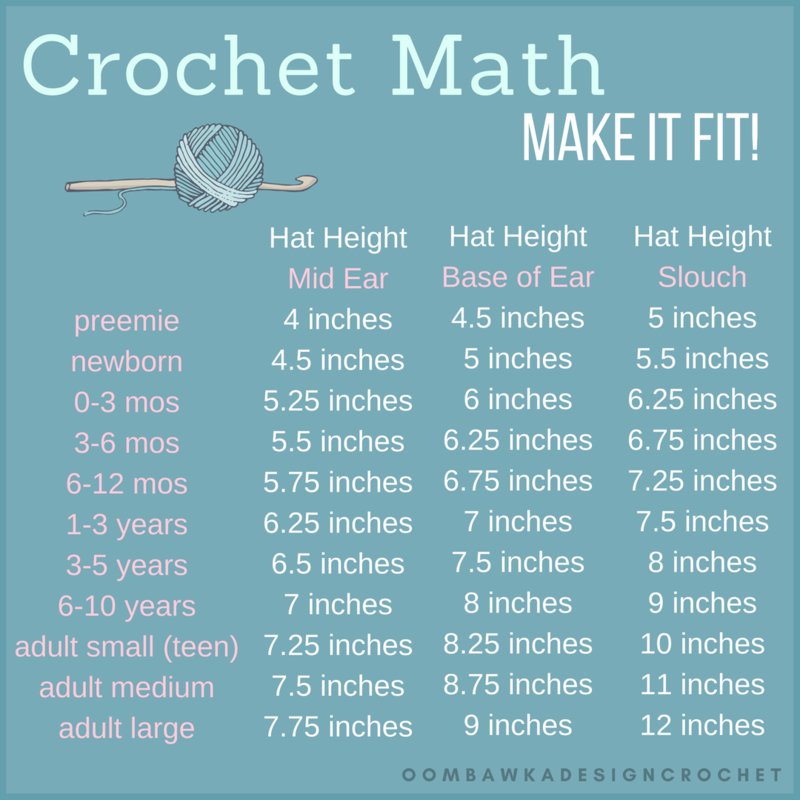 There are many different hat heights you can work for your crochet patterns. These are the 3 different heights I use most frequently. If you are making Earflap hats I recommend working to the mid ear hat height before beginning the earflap rounds. If you are making a hat with a folded brim a slouch hat height often works well. I have included the 3 lengths I use the most, by head size below. If you want to work a specific stitch pattern and you have the gauge for the stitch pattern, you can simply take the gauge and multiply it by the size hat you want to make. This will give you the exact number of stitches you will need for your hat circumference. I’ve included an example below so you can see what I mean. This is the method I use when I design my patterns. I really want your hats to fit correctly. I know that when we work to a specific flat circle diameter and we do not take into consideration the gauge being used, the hat can end up being much too large for someone’s head. So first I work a sample hat using the stitch pattern I want to use with a flat circle diameter measurement. I work enough of the hat to find out what my gauge is for both stitches per inch and rounds per inch. I work the sample in the round because I know gauge fluctuates between projects worked in rows and worked in rounds. It has something to do with how we hold our work when we crochet. Often when we crochet in rounds we have a bit tighter gauge. Once I have my gauge, I calculate the stitches I need for each size in my pattern for the hats I want to offer and then I work up my samples. I create the hat pattern based on a specific stitch number, rather than to the flat circle diameter measurement. Sometimes for my last round, to reach my flat circle diameter measurement, I only increase 6 out of the 12 stitches I could increase by. This is because with those 6 extra stitches I have already reached the number of stitches I needed to make the hat the right circumference. If I increased for that entire round I could potentially increase by 6 stitches too many. If you are working with 3 stitches per inch this would mean my finished hat would be 2 full inches too large. It could still fit at first because I normally allow for 2 inches of negative ease, but the hat would end up being the exact same size as the head it was meant for. After being taken on and off a few times, the hat would stretch and it would be much too large. This is why I feel gauge is important for hat designs and why my final round of increases in a pattern does not always follow the formula I gave you above. I hope this post has been helpful to those of you who want to start designing your own hats. Feel free to leave me questions in the comments, if you have them. This is the perfect guide for hat sizing. Flat circle diameter method actually never worked for me.. Then I also used gauge method. It always results in perfect fitting hat. Would a herringbone half double crochet measure the same as a hd crochet? This is by far the absolute BEST description on hat measurements, and I have read tons! You have clarified so much, especially the part about the adjustment when using cotton! They always turned out too small…thanks to your excellently detailed description, my hats will turn out so much better! Thank you for being so generous in sharing! That’s a sign of a good person!!! Hi Nancy, Yes 🙂 .32 is approximately 1/3 of an inch. 1/4 of in inch would be .25, 1/2 an inch is .5 and 3/4 of an inch is .75. So the 7.32 is 7 and 1/3 inches. Gauge is determined by 2 factors, the height and width of the stitches. Usually a pattern will indicate how many rows or rounds per inch and how many stitches per inch. For the equation you are checking for the stitches per inch. So the width of the stitch, not the height. For your hubby’s hat you would need to know what size his head circumference is and then do a gauge swatch to find out how many stitches per inch you have. Once you know how many stitches you have then you can decide how many stitches you will need for the hat size. So if his head is 25 inches, you should aim to make a hat between 23-24 inches circumference. But I do have a question. It’s a basic question & so may seem utterly lame, but when you talk about GAUGE, are you referring to how TALL or how WIDE my stitches are? (Or is it both?) B/c I’m can’t think how 3 Dcs can = 3″ wide….not unless I’m using uber bulky yarn. It seems my first comment never posted! Thank you so much for doing all the maths. I’ve managed to knit an adult man’s hat using these tips and guidance. It curled, I altered the stitch count and presto flat circle. In worsted weight yarn. Thank you and Happy Christmas. Thank you for this blog post explaining hats. If using worsted weight/Aran (5) are the measurements the same? i.e. for a man’s hat are we still aiming for 7″ diameter? The tips about curl/ruffle were extremely useful! I am working on a hat from a free pattern. I remembered there were places that helped with things like the measurements of your circle and went on a search. I found MORE than I needed and also received the answer to why the circle was buckling a bit. She starts with 12 hdc in the circle! Frogged back, made 8 and voila! – no more curl. It just added one extra row but made a world of difference. So not only did you help me figure out my diameter, hat height and hat circumference – you solved a problem I really didn’t realize I had. Wonderful page and I will be sure to share about it. Wow! Thank you so much for this. Sooooo helpful. Thank you so much for this wonderful post. I always made hats that fit me or my husband. Now I can explore other sizes too. I was stressing out until I remembered seeing your Awesome Hats on Pinterest. Thank You so Much ! You have such a Generous Big Heart of Love! God Bless You! Thank you for this post. It’s fantastic. Now I can make any size hat!! I’m excited.